101 Octane Scooter Parts - Flat washer packs to DIN 125. Item MST-292660 Zinc Plated, Galvanised, or Stainless available. Please select from the list below. 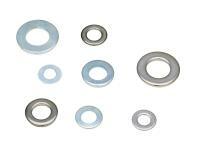 101 Octane Replacement Scooter Parts offer a wide variety of washers, and flat stainless spacers for all your moped and scooter needs. Please measure before ordering for your next moped and scooter repair project. 101 Octane are high quality parts and accessories. Our in-house reccomended brand for replacement accessories. You can buy with confidence for 101 Octane is one of the best parts brands we offer.